First, the Driver must be installed on the machine before then. 1-6 commands can be used with the open marriage Debug Mode only. 7-9 can be used with the machine that faithful into Fastboot Mode only. 1.Check Device used to check the connection of the machine mode ADB. 2.Reset User Lock Code using the tools that are in the data is not lost. 3.Reset Gesture Lock machines that are used to draw a line through the data is not lost. After the installation is complete, it will fire up. Then draw anything for a closed lock. 4.Reset GMail using the machine to try to unlock the machine several times to enter to unlock. 5.Wipe Data used to resolve the symptoms or slow down. Or that an error or some missing. 6.Reboot to reboot your PC or from adb shell. 7.Check Device On Fastboot Mode to check the connection of the machine mode FastBoot. 8.Wipe Data / Cache On Fastboot Mode This command is available only Fastboot Mode to resolve the symptoms or slow down. Or that an error or some missing. That is often found in the CPU Spreadtrum. 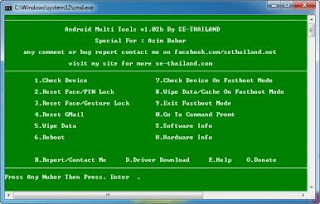 9.Exit Fastboot Mode to reboot your PC or exit FastBoot. Press the number that corresponds to the condition of the machine and then hit enter.